Torger is a hybrid, half vampire and werewolf. He finds his mate, Rikki, moving boxes to her new house and can’t stay away even though the already precarious position that he is in becomes extremely dangerous for both of them, especially for a human who has no knowledge of his world. He has enemies willing to kill him and his family, including Rikki. The mating instinct of his hybrid and the imminent danger puts a target on her that she may or may not be able to dodge. I loved the story line and the characters. The interaction and the close bonds between them is truly wonderful. But there were instances where I felt like I had skipped a couple of books in a series and then started reading this book. I checked around and it appears that this is the second book in a series, the first being Her Ancient Hybrid. 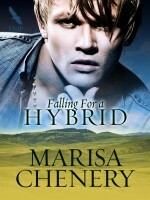 It seemed that Falling For A Hybrid had some missing elements or information I needed. I think if I had read the first book it might have filled in some of those blanks. My one regret is that this book finished too fast. It has the potential to be a great full-fledged series. Or even a novel. For a short story, it was very full. There was family drama, love and then comes the paranormal stuff. For anyone who loves paranormal, this book is for them.